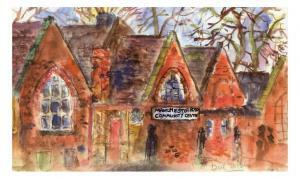 The Manchester Road Community Centre is an historic red-brick building that has been taken over by a local charity. It is now a centre of art and learning and is spearheading creative community projects in the Bury area. Although the frontage is next to the main road, there are two peaceful garden areas to the rear, giving out to a significant wooded area with a woodland walk. The failities include one large hall with a stage and smaller work areas, together with a functional kitchen. There are also artists studios. The building is completely wheelchair accessible. There are pleasant suburban surroundings and the River Roch is just a short walk away. Manchester Road (the A56) leads to Bury town centre, with its Metrolink station, to the north (about 20 minutes walk). To the south we are about ten minutes drive to Junction 17 of the M60 motorway. Junction 3 of the M66 is only a few minutes away. There is street parking in the surrounding streets (quiet, residential). Buses to and from Manchester and Bury stop near the door. By bus - the 135 Manchester/Bury bus stops outside - it runs about every 10 mins and you get off at the Swan & Cemetery pub. By Metrolink - the nearest stops are Bury to the north and Whitefield to the South. The Centre is about five bus stops from Bury town centre on the 135 bus or about 20 minutes brisk walk.